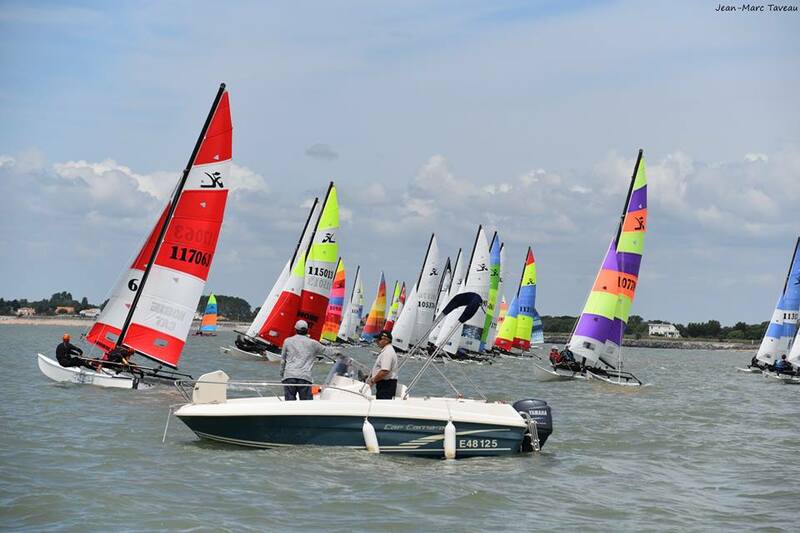 The 2017 best French Hobie event took place last week-end at Châtelaillon-Plage. It was a really great moment, thanks to the host club which was totally involved in the organization of a Hobie spirit event. Moreover, for the occasion, Hobie Cat Europe put at a team disposal a Wild Cat (a selection made in Toulon a few weeks before decided among selected teams the best one). Fifty boats were registered. We have to underline the increasing presence of Wild Cat, the increasing dynamism of Hobie Cat 14 and the Hobie Cat 16 loyalty. The day before the event, a training session was proposed to HC16 and HC14 teams. Weather was perfect with a gentle breeze. A welcome aperitif was offered by the French Hobie Class Association. The gentle breeze gave way to rough conditions (25 knots). Three races in each series were sailed. Wild Cat, Hobie Cat 15, Hobie 18 and Hobie Cat 14 took the first departure, and Hobie Cat 16 spi and Hobie Cat 16 classic took the second. Arnaud Thieme took the first place way ahead of other Hobie Cat 14 competitors. Alexandre Molina and Vianney Salvi took the first place of Hobie Cat 16 spi… but Cedric Bader, the European past champion, and his crew Auxence Thomas were not far. Pierre and Brigitte Arbona took immediately the first place of Hobie Cat 16 classic. A welcome cocktail was offered by the host club to competitors to open the Championships, and a local rock band gave a concert for a non-stop dance party! The general assembly of the AFHC was followed by a meeting of the Bureau. This was the occasion to welcome new members and assigned new roles and functions. Adélie Pomade was elected Chairman of the AFHC and is still responsible for international relations, Orion Martin was elected Vice Chairman, Françoise Dettling was appointed Honorary Chairman, Ludovic Siguret was elected General Secretary, Sylvain Chanteloup was elected Treasurer. There was less wind and better conditions for teams to sail. Clément Peduzzi and Maxime Blondeau on #Hashtag maintained their first place among Wild Cat. Cédric Bader and Auxence Thomas took the first place in the category Hobie Cat 16 spi and kept it until the end of Championships. In the evening, the traditional meal for crews took place in a friendly atmosphere, and gave the opportunity to sailors to exchange their feeling and technical advice. It was also the opportunity to celebrate the 40th anniversary of the local dealer Proust Sailing…with a big birthday cake! Good weather conditions allowed two races. 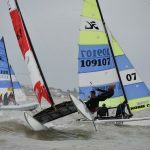 Clément Peduzzi and Maxime Blondeau kept the first place in the Wild Cat category, Pierre and Brigitte Arbona kept the first place in the Hobie Cat 16 classic category, and Arnaud Thieme took the first place in the Hobie Cat 14 category. The competition ended by the award ceremony and a very friendship drink. In 2018, the French Hobie Championships will take place in Hyères (Provence-Alpes-Côte d’Azur) and will be organized by the COYCH Hyères. See you at the French Championships 2018!